California’s largest reservoir, Shasta Lake, sits where the dry Central Valley meets the rainier, mountainous northern part of the state. At its western edge is Shasta Dam, 602 feet high, built by the Bureau of Reclamation between 1938 and 1945 to help irrigate California. For decades, agricultural and municipal water districts have sought to heighten the dam to capture more water as it runs out of the Cascade Range through the McCloud, Pit and Sacramento rivers. Environmentalists have long rallied against the proposal, and state officials contend such a project would violate California law. Now, though, with a push from some members of Congress and the current Interior Department, the idea has been given new life. The Shasta Dam, built in the 1930s and 40s, could be raised another 18 feet, under a new proposal. In January, the Interior Department informed Congress that, under the Trump administration, it had a “renewed focus on the development of new water storage in California and elsewhere.” Austin Ewell, a land and water use lawyer from Fresno, California, who became Interior’s deputy assistant secretary for water and science last fall, recently told a water authority meeting in central California’s San Joaquin Valley that construction on Shasta could start as early as late 2019. Shasta Dam is a critical part of the Central Valley Project, a sprawling water system that runs 400 miles from Redding to Bakersfield. 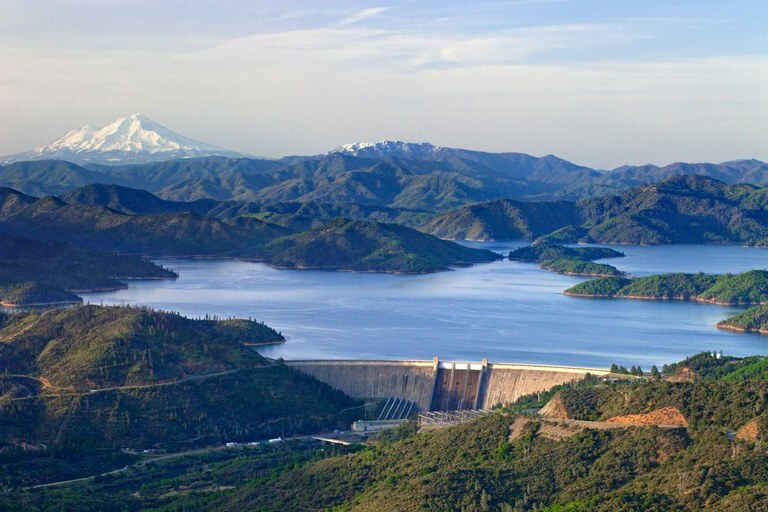 Shasta Lake holds 4.5 million acre-feet of water, allowing for hydroelectric power, flood control and critical water storage. But the dam also looms large in the life of the Winnemem Wintu Tribe, whose members live nearby. The people were forced from their land when the dam was built; in fact, their ancestral burial grounds were flooded by the reservoir. Tribal Chief Caleen Sisk says 183 graves were dug up and moved when the dam was constructed. Others, however, were left behind. “There are a lot of burial grounds under the lake and will be more if they raise the lake,” she says. More ancestral land would be swallowed, including the site of a traditional coming-of-age ceremony that the tribe still uses today. Sisk also opposes the dam raise because it could threaten salmon populations already decimated by low stream flows, habitat loss and waters increasingly warmed by climate change. Salmon no longer live in the rivers above the dam; downstream, they continue to struggle. 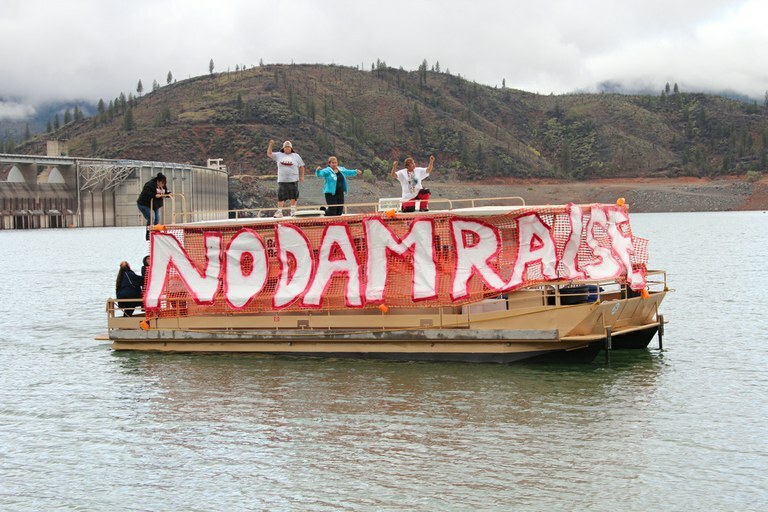 In a 2013 protest, members of the Winnemen Wintu Tribe motored a “No Dam Raise” houseboat in front of Shasta Dam. Hundreds of miles downstream, coastal fishermen also worry that enlarging the dam would harm the last remaining local chinook salmon. Noah Oppenheim, executive director of the Pacific Coast Federation of Fishermen’s Associations, says the project prioritizes farms over fishing. In the late 1970s, nearly 5,000 commercial fishermen netted and hooked salmon off Northern California; now, less than 400 do. “It’s death by a thousand cuts, and the dam is another cut,” he says. Federal agencies appear to disagree about what a Shasta Dam raise would mean for salmon. A U.S. Fish and Wildlife Service draft report obtained by Friends of the River through a Freedom of Information Act request said the raise would likely prove detrimental to endangered chinook salmon, because it would decrease downstream flows. But project supporters point to a different report, by the Bureau of Reclamation, which says the project could actually benefit salmon by creating colder waters on the Sacramento River. Some of the biggest champions of the Shasta Dam raise are agricultural districts. “The reality is, people need water and farmers need water,” says Tom Birmingham, general manager of the Westlands Water District, the largest agricultural water district in the United States. “We have to use every tool available … and being able to capture water in storage during periods of high runoff has to be one of those tools.” Raising the dam would provide an additional 600,000 acre-feet of water annually — enough, for example, to irrigate over 275,000 acres. Westlands’ critics respond that raising the dam will mainly benefit corporate ag interests. But Birmingham says thousands of workers will suffer if districts like Westlands don’t receive enough water. During intense regional drought in 2015, allocations were zeroed out, and farmers were forced to fallow fields. There are many unanswered questions, including the vitally important one of who would pay for the project. An 18-foot boost would cost at least $1.3 billion. So far, the project has only $20 million from the 2018 federal Omnibus bill. Nevertheless, Erin Curtis, a Bureau of Reclamation spokesperson, told HCN the agency plans to move forward this year with pre-construction design while it looks for potential cost-sharing partners. Meanwhile, the state of California is gearing up for a fight. State officials say raising the dam would violate California’s Wild and Scenic River Act, which protects a stretch of the McCloud River for its trout fishery and “free-flowing condition.” And, if the project does get a green light, several environmental groups will likely sue the federal government or cost-sharing water districts. Note: This story has been updated to correct the spelling of Tom Birmingham’s name.